Although the summer weather seems to have taken a break this week with persistent clouds and patchy rain, the Union Square Partnership is gearing up for warmer temperatures with a schedule of outdoor activities to take place in the park throughout the season. Summer in the Square officially kicks off today, offering free activities to entertain both kids and adults on Thursdays until August 13. Fitness programs will be available in the mornings and evenings, while programming for children will mostly take place in the middle of the day. Jazz performances will take place in the park for the lunchtime crowd and while all of the activities are family friendly, the music performances in the evenings will be geared more towards commuters heading home after work. Union Square Partnership executive director Jennifer Falk said that all of the activities available are thanks to partnerships with businesses in the neighborhood, many of which have participated in Summer in the Square in previous years. Some new businesses, like Reebok, are participating for the first time since the store on Union Square West only opened within the last year, but this is also the first year that the Strand Bookstore, which has been in the neighborhood for more than 60 years, is getting involved. Falk said that the bookstore will be joining the activities for a story time that centers around a new theme every week. 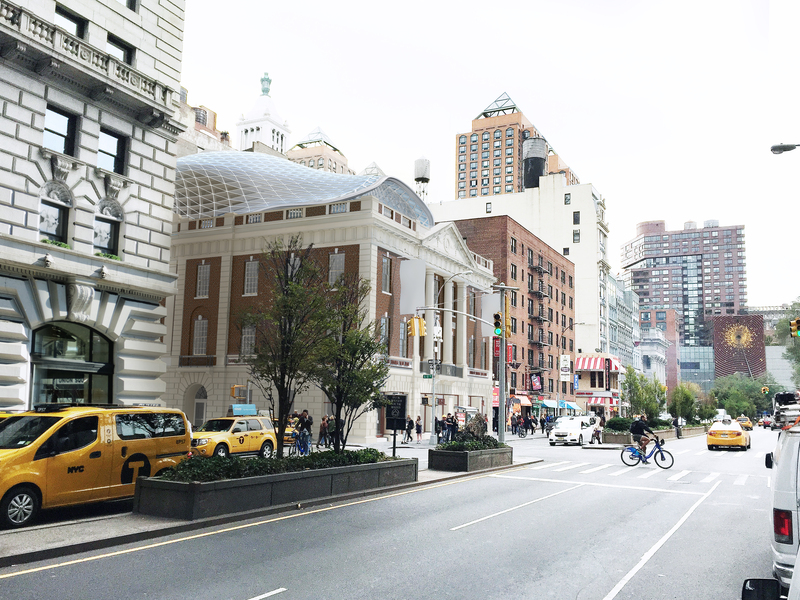 The plan to add a shell-shaped glass dome onto the old Tammany Hall Building in Union Square has been turned down by the Landmarks Preservation Commission. It was during a hearing that took place on Tuesday, November 25, when the Commission declined to approve the rooftop addition for the recently landmarked building. However, the LPC left the door open for the applicant, the architectural firm BKSK, to submit another proposal — and a revised design is already in the works. Following the hearing, BKSK’s lead partner on the dome project, Todd Poisson, said the firm is hoping to meet with the Commission’s chair informally in January to discuss it and then present it again to the entire Commission. The dome was intended to create room for around 20,000 square feet of office space. Half of that would have been in the newly created space while the rest would be in the existing structure. Along with the dome, which would have replaced the current slate roof and raised the building’s height by two stories, other proposed changes to the property include removing the theater, restoring the storefront infill, replacing signage and adding windows and a new entrance. Poisson, who’d given testimony alongside partner Harry Kendall, later acknowledged, in an interview with Town & Village, the “range of opinions” from the Commission on why the proposal hadn’t gotten the green light. The content he was referring to was inspired by Tammany, the Native American chief of the Lenape. Poisson said the symbol of Tammany’s clan was a turtle, which was from a creation myth of a great turtle rising from the sea and creating land and putting mud on its shell. The idea behind the shell concept at the property, said Poisson, was to “re-brand” Tammany as not just a name synonymous with a corrupt political machine but the chief who helped develop peaceful relations with the European settlers. However at the November hearing, not everyone was moved by the historical reference. The few speakers who came to give testimony in support of the proposed alteration were outnumbered by over a dozen in opposition of it, with most saying they thought the contemporary design was inappropriate. 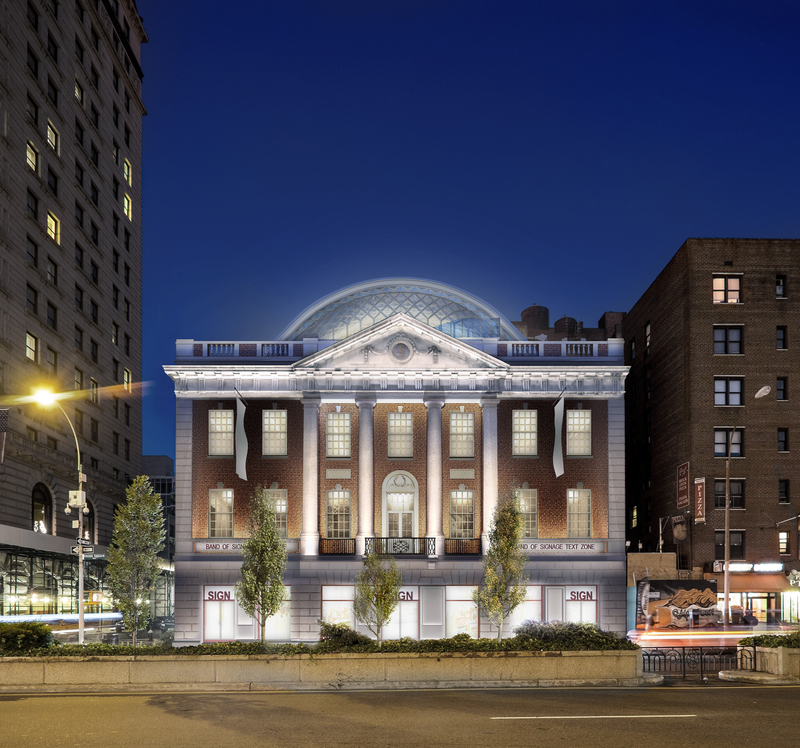 Removing it, he said, “would be to demolish a protected architectural element of the designated structure.” The building, he continued, had been designed to look like the Georgian-inspired architecture of the old Federal Hall on Wall Street. Federal Hall, where George Washington took his oath of office, also had a hipped attic roof. Others who either gave testimony in person or via written statement against the dome proposal were Council Member Rosie Mendez, the Historic Districts Council, Community Board 5, Gramercy Neighborhood Associates and the New York Landmarks Conservancy. In support of the plan however was Jennifer Falk, executive director of the Union Square Partnership, who gave her testimony in person. She later explained that she did so because the building was very much in need of attention, and the BKSK plan would have added something “bold” to the roof while restoring the rest of the property. Falk added that the USP looks forward to seeing how the design evolves. Taylor, meanwhile, said he couldn’t help but point out that while the USP supported the new roof, it didn’t lend its support to the landmarking effort. In response, a spokesperson for the USP said the Partnership had been in support of the designation. However, since the effort wasn’t facing opposition once the building owner decided to support a designation, the organization didn’t feel it was necessary to send anyone to testify. Other people who testified in support of the dome included Barry Benepe, co-founder of the Union Square Greenmarket, and Margaret Cotter, president of Liberty Theaters and the building’s owner. Along with needing the LPC’s blessing to move forward with a plan to create office space, Cotter would also require a special use variance to build the dome. Poisson said this is because the eastern most portion of the property falls into a different zone than the rest of the building, and the eastern zone is residential. Community residents and local restaurateurs came out in full force last Thursday night to celebrate the impending arrival of fall at Union Square’s 19th annual Harvest in the Square event. The food tasting festival raised $334,000 and Jennifer Falk, executive director of the Union Square Partnership, said that she will be speaking with the Parks Department soon to discuss goals for the coming year and determine how the money will be spent. Tickets were $125 and $400 for early VIP entry. Danny Meyer of the Union Square Cafe and Eric Petterson from The Coffee Shop are the founding members of the event and have been participating every year. 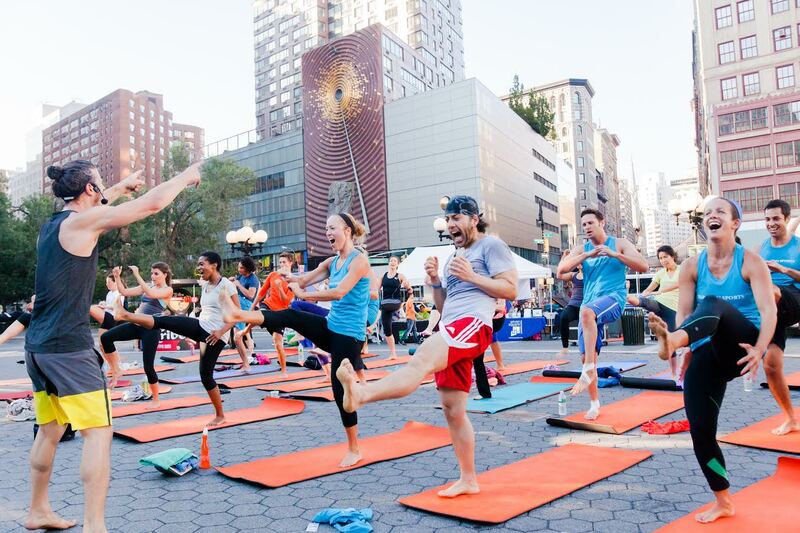 Other returning participants included the Union Square Whole Foods, Blue Water Grill, Rosa Mexicano, Almond, Blue Smoke and others, with nearly 50 local restaurants in all. Some new restaurants participating in the event for the first time included The Pavilion, All’onda, The Gander, Cevich, 201 Bar and Restaurant and Botequim. Richard and Kamille Serna, residents of the Financial District, are in the area frequently because they manage a building on 15th Street. Although they’ve been working in the area for a while, this was the first chance they got to partake in Harvest in the Square. Kamille said they were impressed with what they tried so far but were particularly looking forward to sampling what Blue Water Grill had to offer. The Union Square restaurant’s Executive chef Luis Jaramillo was serving Maine lobster deviled eggs with tarragon. 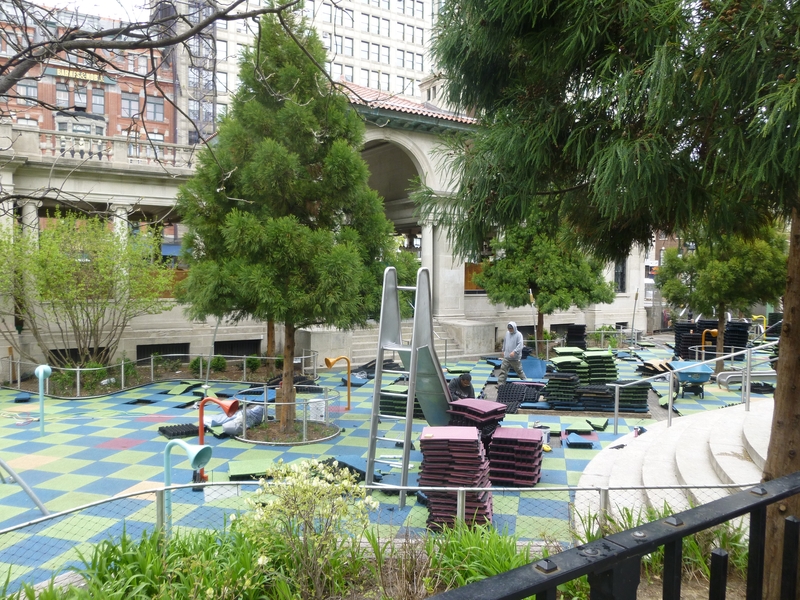 Recently, the playground at the north end of Union Square Park, known as “Evelyn’s Playground,” got a bit of a makeover. A new soft surface replaced the one that had been there since it opened and had undergone much wear and tear. Along with heavy use, another destructive factor, which turned the spongy ground covering into Swiss cheese was high heeled shoes. At the newly opened playground, there are no heels allowed. Other recent improvements to the park include increasing the free public WiFi network capacity eight-fold to accommodate more users and the return of solar-powered cell phone charging stations at three of the sitting areas. Then of course, there’s the controversial restaurant inside the park’s pavilion, fittingly named The Pavilion. It finally opened for business on May 1 after community activists lost a court battle arguing such a commercial enterprise didn’t belong on park grounds. Jennifer Falk, the executive director of the Union Square Partnership, recently spoke with Town & Village about the restaurant, the playground improvements and other springtime work aimed at improving the Union Square district. The former playgrounds, she pointed out, only totaled 5,000 square feet and these days more of the playground’s visitors come from further away just to enjoy it. It wasn’t just the size but the improved rides that have brought in more kids and the new safety surface, instead of the old asphalt, has been a hit with parents. The funds to make the recent round of improvements, which had a pricetag of $175,000, were raised by the USP. In total, close to $350,000 was raised and some of that money will also go towards the park’s annual series of free programming, Summer in the Square. As always the Thursday series, kicking off this year today, June 12, will include kids’ events, fitness and dance classes and low-key lunchtime jazz concerts. 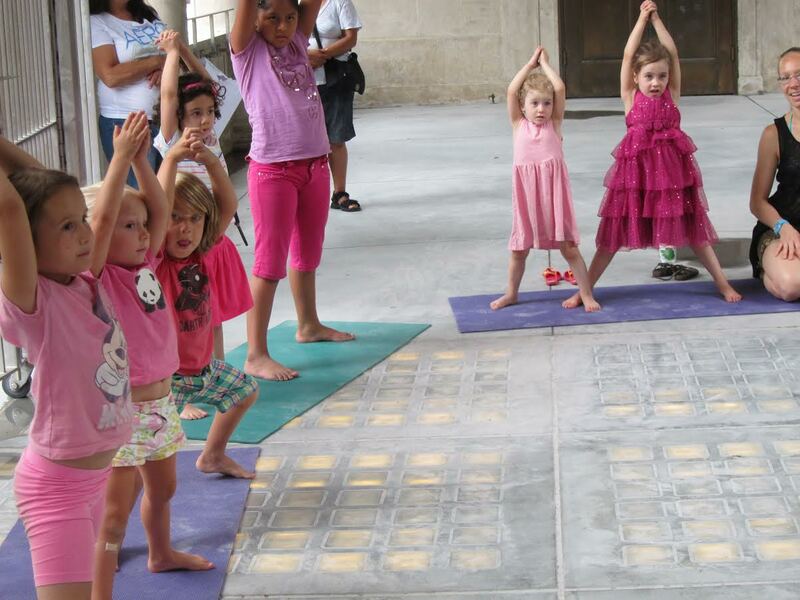 On June 12, things start early with “Wake up Yoga” at 7 a.m. Yoga storytime for kids starts at 10 a.m. With the Gazillion Bubble Show at 10:30 a.m. Things will wind down at 1 p.m. after jazz with students from The New School until the evening. (In response to feedback from a recent survey, the USP has expanded the SITS schedule to offer additional fitness classes in the evenings.) There will be a return of past years’ boot camp, running club and evening yoga. Currently, the restaurant is just open for dinner but hours are expected to expand soon to include lunch and eventually breakfast. 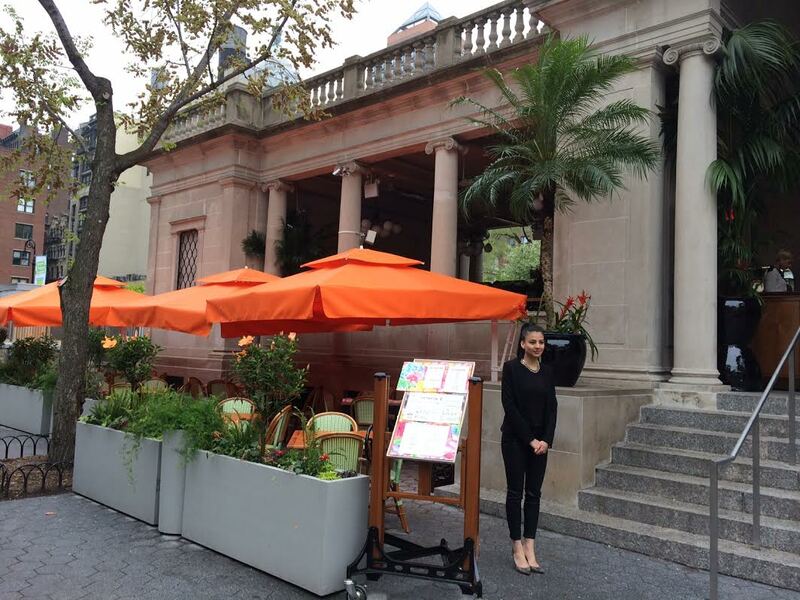 Price wise, it’s not the Tavern on the Green activists feared, but it’s no Shake Shack either. The menu now includes dishes such as hanger steak ($23.50), kale caesar salad ($11.95), short rib ravioli ($17.50) and oysters ($3 a piece) with ingredients bought from the park’s greenmarket. Also among the arguments against the restaurant by the Union Square Community Coalition and other critics was that the Pavilion should be used for events, preferably for children, rather than a commercial enterprise. However, even with a business in the space, the kiddies haven’t been forgotten completely as now there’s Tuesdays @ The Pavilion, a free, weekly crafts and story time event from 3-5 p.m. Veterans also had their day at The Pavilion recently when the restaurant and the USP sponsored a luncheon for former servicemen and women in celebration of Memorial Day. The event was also in recognition of the one-year anniversary of the Manhattan VA Medical Center reopening after Hurricane Sandy. “The Partnership hopes to make this an annual event to continue to connect our local businesses with community organizations,” the USP wrote in a recent blog post. The park has also recently undergone landscaping work, with the lawns reopening for picnickers and sunbathers. For a schedule of events taking place throughout the summer, visit unionsquarenyc.org.